In ELA our 5th grade crew studies athletes as leaders of social change. As a crew, we completed a case study on Jackie Robinson and what led to his success in creating social change. Students also conducted independent research on other athletes who have chosen to take a stand to change society. Because students had studied so many different eras and athletes, we needed a way to come together and learn from one another. So we hosted a Socratic Seminar. A Socratic Seminar is a formal conversation based on research. There is a lot of prep work that goes into hosting a successful Socratic Seminar. One of the most important preparations in explicitly teaching conversation skills. For several weeks before our Socratic Seminar we spent crew time participating in initiatives that promote positive conversation skills. We started by brainstorming what it really looks like and how it feels when someone is truly listening to you. 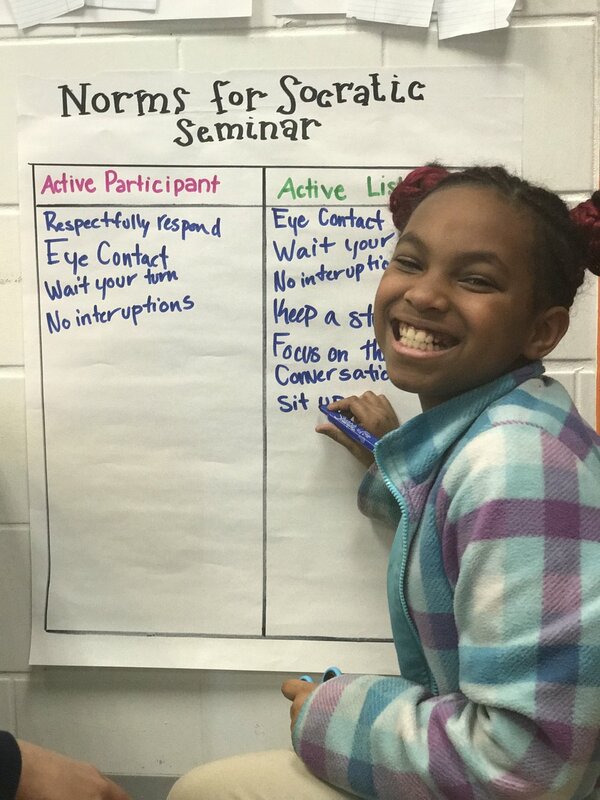 Students narrowed this list down to 3 key norms for conversation: eye contact, responsive body language, and waiting your turn to speak. We then debriefed daily on how we did with these norms. Students also gave me feedback on norms that I identified I needed to work on. After establishing basic conversation norms for our crew, we had to distinguish between informal and formal conversation. Students then worked together to create norms for professional conversation. These norms included speaking loud and clear, responding respectfully, using academic language and citing evidence to prove your claim. We then went into clearly defining what respectful responses would sound like. Students created a list of sentence stems that they could use to guide their response, and we practiced using the sentence stems in our daily discussions so that students felt comfortable using them. In the days leading up the Socratic Seminar students had to prepare their claims and supporting evidence. Students were asked to form an opinion about which factor is the most important in making successful social change. Students were able to look back at their annotated text, speeches by athletes and notes documentary clips. They selected the strongest evidence, cited their sources and explained how they supported their opinions. They used this to create notes to help them in discussion. When the day of our first full Socratic Seminar came, students facilitated the discussion. They listened to their crewmates and responded. Afterwards students were given time to reflect on key points that came up in discussion and draw final conclusions. Finally, we debriefed our norms, rating how we did using conversation skills that we had established together.